The brilliant explosions of dead stars have been used for years to illuminate the far-flung reaches of our cosmos. 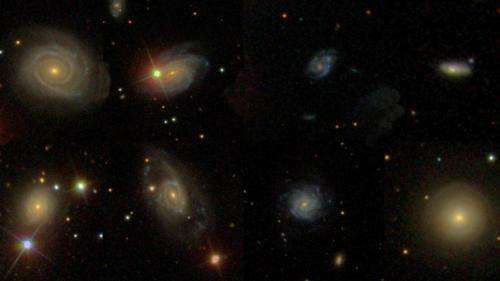 The explosions, called Type Ia supernovae, allow astronomers to measure the distances to galaxies and measure the ever-increasing rate at which our universe is stretching apart. But these tools aren't perfect. In the cosmic hardware store of our universe, improvements are ongoing. In a new report, appearing March 27 in the journal Science, astronomers identify the best, top-of-the-line Type Ia supernovae for measuring cosmic distances, pushing other, more clunky tools to the back of the shelf. Using archived data from NASA's Galaxy Evolution Explorer (GALEX), scientists show that a particular class of Type Ia supernovae that occur near youthful stars can improve these measurements with a precision of more than two times that achieved before. "We have discovered a population of Type Ia supernovae whose light output depends very precisely on how quickly they fade, making it possible to measure very exact distances to them," said Patrick Kelly of the University of California, Berkeley, lead author of the new study. "These supernovae are found close to populations of bright, hot young stars." The findings will help light the way to understanding dark energy, one of the greatest mysteries in the field of cosmology, the study of the origin and development of the universe. Dark energy is the leading culprit behind the baffling acceleration of our cosmos, a phenomenon discovered in 1998. The acceleration was uncovered when astronomers observed that galaxies are pulling away from each other at increasing speeds. The key to measuring this acceleration—and thus the nature of dark energy—lies with Type Ia supernovae, which work much like light bulbs strung across space. Imagine lining up 60-watt light bulbs across a field and standing at one end. The farthest light bulb wouldn't appear as bright as the closest one due to its distance. Since you know how bright the light bulb inherently is, you can use the extent of its dimming to figure out the distance. Type Ia supernovae, also referred to as "standard candles," work in a similar way because they consistently shine with about the same amount of light. While the process that leads to these explosions is still not clear, they occur when the burnt-out core of a star, called a white dwarf, blasts apart in a regular way, briefly lighting up the host galaxy. However, the explosions aren't always precisely uniform. They can differ considerably depending on various factors, which appear to be connected to the environments and histories of the exploding stars. It's as if our 60-watt bulbs sometimes give off 55 watts of light, skewing distance measurements. Kelly and his team investigated the reliability of these tools by analyzing the surroundings of nearly 100 previous Type Ia explosions. They used data from GALEX, which detects ultraviolet light. Populations of hot, young stars in galaxies will shine brightly with ultraviolet light, so GALEX can distinguish between young and older star-forming communities. The results showed that the Type Ia supernovae affiliated with the hot, young stars were significantly more reliable at indicating distances than their counterparts. "These explosions are likely the result of youthful white dwarfs," said Kelly. By focusing on this particular brand of Type Ia tools, astronomers will be able to, in the future, make even sharper measurements of the size and scale of our universe. According to the science team, this class of tools could work at distances up to six billion light-years away, and perhaps farther. "GALEX surveyed the entire sky, allowing past and future eruptions of these high-quality standard candles to be identified easily," said Don Neill, a member of the GALEX team at the California Institute of Technology in Pasadena, not affiliated with the study. "Any improvement in the standard candles will have a direct impact on theories of dark energy, allowing us to home in on this mysterious force propelling the acceleration of the universe." Caltech led the Galaxy Evolution Explorer mission and was responsible for science operations and data analysis. The mission ended in 2013 after more than a decade of scanning the skies in ultraviolet light. NASA's Jet Propulsion Laboratory in Pasadena, California, managed the mission and built the science instrument. The mission was developed under NASA's Explorers Program managed by the Goddard Space Flight Center, Greenbelt, Maryland. Researchers sponsored by Yonsei University in South Korea and the Centre National d'Etudes Spatiales (CNES) in France collaborated on this mission. I have often been suspicious of the standard story that type 1a supernovas involve white dwarfs. White dwarf stars in multiple star systems are the source of novas, as hydrogen (and helium) burns off. What makes a supernova different? If 1a supernovas only occur when a critical mass is reached, why aren't they all identical (or more identical). If a known plusar explodes as a supernova, that would be a smoking gun. But it may be a long wait.